“First I traveled through the seven levels of the Candy Cane Forest, past the Sea of Twirly Swirly Gumdrops”…..oh no wait that’s from Elf. There’s just something about this stretch of woods and trails that makes that line instantly pop into my head. But with trail names like Make Believe and Twisted Pines you’ll think you’re in a fairytale. It’s a cross-country skier’s fairytale. There are legends of wild beasts spotted here. 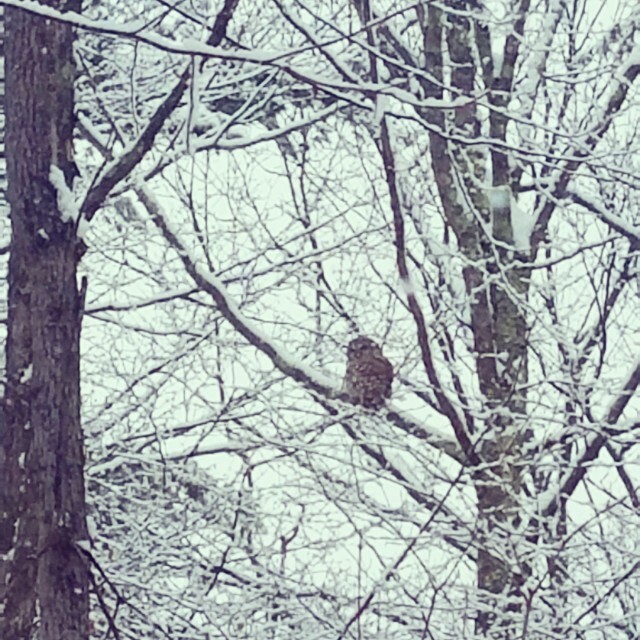 Bear, Eastern coyote, bobcats, the occasional bunny, and today a wise old owl “hoo” dropped in to say hello. I asked him for some wisdom about my ski but he gave me no direction. Either I’ve learned all I can or I’m too far gone to help! Or perhaps he was pondering something so deep he doesn’t hear me. He’s super still, so quiet. I leave him to his perch and watchful eye over the woods and I set out on my adventure. I have skied these trails before, many times. It’s an ideal setting for the beginner or the advanced cross-country skier. I prefer to use a backcountry set up because the trails in our area are so diverse, it helps to have a metal edge to make turns. Luckily, even if you don’t have that, you can still find a good loop on Hardy Road that will work for you. 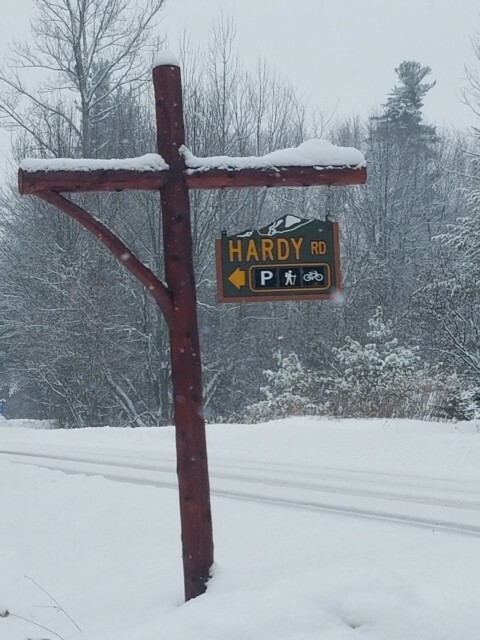 Hardy Road is located just off Springfield Road in the town of Wilmington, NY. Any GPS or map system on any mobile device can get you there (don’t worry I checked). There are signs pointing the way as you turn onto the road and even one that warns you that the trailhead is coming up. You do have to cross the road to get to the trails from the parking area — so watch out for cars and people! I was lucky enough to have the trails to myself, a rare occurrence. I set out with my dog (I say dog…he’s part bear; he’s been mistaken for one before on more than one occasion) Ralphie. The snow is sticky today. Good thing I waxed! The trail system splits into two, Safe Bet and Good Luck trails to the left, and Make Believe and Twisted Pines trails to the right. I’m feeling a little whimsical today and the way the snow is falling in big chunks it really does seem like something right out of a fairytale. So we head right. Ralphie leads the way zig-zagging through big tall pines and long winding trails with some good, steady, low-grade uphill. If you’re looking for a slow steady ski, this is your trail. It takes you through beautiful settings right out of a storybook. It eventually does intersect with Twisted Pine, which is self-explanatory in its name. It’s twisty. So if you’re not feeling adventurous steer clear. But if you are looking for a fun trail with some ups, downs, twists, and turns, this one is perfect for that. Ralphie looks at me like I’m crazy. I love the challenge of the tough turns on it. I notice people have cut the switchbacks to make them easier. Try to avoid that if the trail is clearly marked. The trails finally loop back around and meet up with Safe Bet and Good Luck trails. I have a feeling there is some sarcasm behind the names because I know what’s coming. 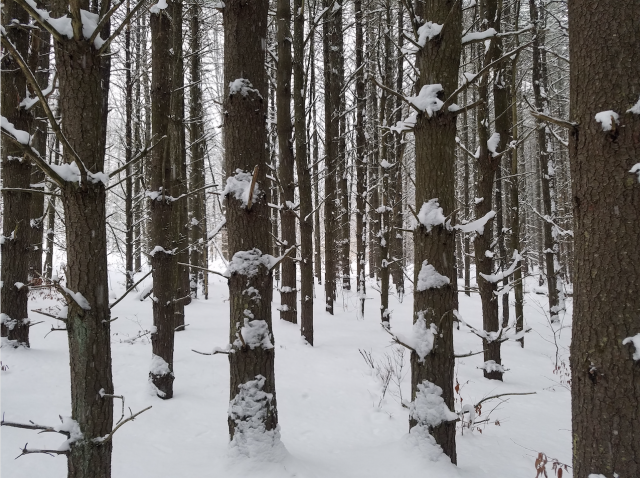 These trails are everything a cross-country skier with a wild heart and snow in their veins looks for when they want to get their pulse going. So I start down the straightaway. Don’t let this fool you — it’s deceiving. Safe Bet leads you up a steeper climb but with some worthwhile views and fun drops on the other side. It eventually mellows out and meets up with Good Luck which is made up of some smooth rolling switchbacks. Ralphie has some serious snowballs on his feet so we head back to the trailhead. It’s a satisfying day of cross-country skiing. Two and a half hours to complete the loops, but anyone could make a day of it. A few things you should know before you get out there. Any trail in the Adirondacks should be taken seriously. Do a little research into the area you’re heading before you get there. Check weather conditions, it can change fast. Bring a small backpack with supplies and extra gear. Make sure your gear is up to snuff! Anyone can get turned around on any trail. Luckily the trails on Hardy Road are all very well marked and all lead back to one another. It does have a few that do not have markers but thankfully they also loop back to the main trails. This trail system is also flanked by two plots of posted land, so please be respectful. 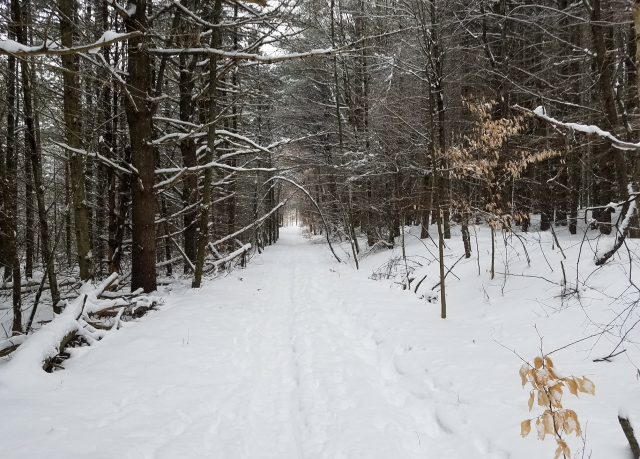 Hardy Road, also known as Beaver Brook Tract, is one of the best places in the area for satisfying a cross-country skier of any level. I encourage you to get out and explore! - The Flume Trails located right off Rte. 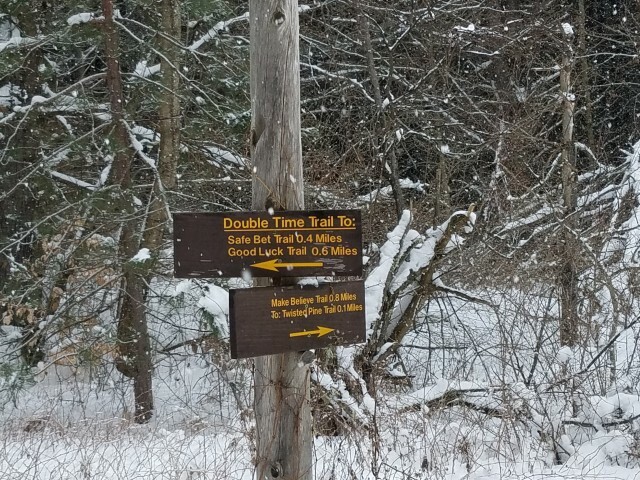 86 just before Wilmington, provide easy cross-country trails, beautiful views of the Flume waterfalls, and are located right around the corner from Whiteface Mountain. - The Whiteface Mountain Veteran's Memorial Highway promises gorgeous views of the High Peaks. Drive up the highway until you reach the toll booth, put it in park, and clip in! This road has a low grade that snakes up the backside of Whiteface Mountain. It’s a long way all the way up to the top but what you get in return is completely worth it. On a blue bird day the view is incredible. Plus, it’s literally all downhill on the way back. - Cooper Kiln Trail is great - especially if you have two cars available. If you don’t have two cars, it’s not a particularly long trail, but you will end up back tracking. I recommend going in from Gillispie Drive located off of the Whiteface Memorial Highway. This offers an easier approach to the trail. If you choose to start from the Bonnieview Road trailhead it’s a long climb. Either direction leads to a clearing with a lean-to, bring lunch and your camera. Pack appropriately, and this is a great spot for an overnight skiing and camping trip. Wilmington has a lot to offer when it comes to cross-country skiing. The best part is, it’s free, there are no lines, and you can make your own adventure. Whether you have just a few hours to kill, you want to pack a lunch and find a spot of your own, or you plan to make a full-day adventure of it, there are many options to choose from in the Whiteface region. Peruse our cozy lodging options and plan to hit our trails this winter! Guest Blogger: Kimmie Ames, avid skier and Adirondack adventurer.